Agricultural labor shortages and the drive for ever-higher productivity to control costs and keep prices low is driving the development of apple harvesters that rely on vacuum systems. These systems have been under development for several years, with promised introduction in 2018. Will this be the year that vacuum-driven automation reaches the orchards? Equipment developers are approaching the challenge in two different ways. One relies on human pickers, and uses the vacuum for collection and transfer of the harvested apples. Workers on the ground pick apples within reach, while fellow workers on an elevated moving platform pick the apples higher on the tree. Both wear a small bucket as attached to a vest and connected to a vacuum system that transfers the apples through a tubing system. Each apple is deposited in its own pocket to reduce bruising, before gently being transferred to a collection bin. The alternative is a system that seeks to actually pick the apples from the trees with a suction system, thereby largely replacing human pickers with automation. This approach relies on a sophisticated vision system that can find the apples on the tree and pluck them from the branch using a vacuum hose. Trials of the system indicated picking rates of more than one apple per second, but only with the picker stationary, and without the ability to reach the entire canopy of the tree. Even as the mechanisms of each approach advance, future improvements to both technologies may involve changes in the orchards themselves. 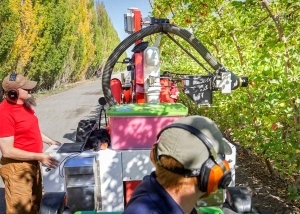 Training and pruning trees to create parallel tree walls that are more readily accessible to the pickers – whether humans on a moving platform or robotic suction arms – could ultimately determine if vacuum apple harvesting is the future.